The owner of fishing boat “Rough Diamond” required more power and speed to reach distant wrecks quickly thus giving his paying customers a better experience on board. He was achieving speeds around the mid-20s (knots) with a Mercury 4 Stroke 115 hp outboard which just wasn’t enough, so we recommended he instead had a Mercury 200 hp Verado fitted as well a stainless propeller, suitable for when the boat was loaded with passengers. With the new engine, we also fit a “Mercury Big Rig” kit, which included an upgraded hydraulic steering, a gel starting battery, twin Mercury Smart Craft gauges and electric control with trolling feature for bass fishing. 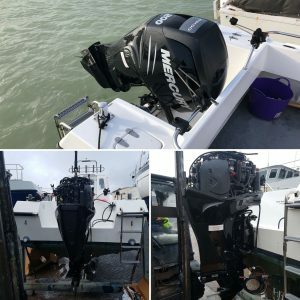 The Mercury 115 hp outboard was removed in our yard at Brighton Marina and sold within 48 hours using the Mercury Outboard dealer network. From start to finish, the Mercury 200 hp Verado was lifted into place with a forklift and the boat was launched and ready for use within days. The boat now reaches speeds in excess of 40 knots and cruises around 30 knots at 4000 RPM. The owner is over the moon and is looking forward to a busy season ahead! Should you wish to get out on the water fishing, we’d highly recommend giving them a go – Lite Line Charters – website coming soon! The engine was supplied and fitted by West Marine Services, once again giving a highly competitive price and excellent customer service. Contact us for current special pricing offers on all new Mercury Outboards.